DALLAS (WBAP/KLIF)- Dallas Federal employees who have been furloughed from work or working without pay are protesting the partial Government Shutdown. Dr. Sarah Frey, Physical Scientist at the U.S. Environmental Protection Agency (EPA) said she just bought a house and has a 2 year-old-daughter, she said the uncertainty of not getting another pay check is terrifying. “We are not just names and acronyms affected we are real people….we are all in this together and we are here to show our congress people and senators we want to work, put us to work,” Frey said. 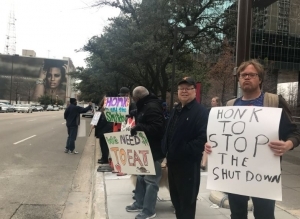 Members of FEMA, TSA and the EPA gathered on the streets of Downtown, holding signs in an effort to get the attention of Texas Government leaders. “There are many federal workers in Dallas, many people think this is only a problem in Washington however this affects us nation-wide,” said Justin Chen, another EPA worker. Some also said the shutdown is a safety hazard because the FDA has stopped routine food inspections and some TSA officers won’t work without pay. “This is bringing a whole lot more insecurities for issues that are far more prevalent than border security…at the EPA we’re not conducting our inspection we are not guaranteeing the safety of our water, air, the land that people live in,” Chen said. The Partial Government shutdown nears 3 weeks.